Born on 16th March, 1956 in Shillong (Meghalaya). Studied in St Edmund's College, Shillong, (1962-1966) and St Columba's High School, New Delhi (1966-1971). Passed the Indian School Certificate Examination in 1971-1972. Was selected for the National Science Talent Scholarship (1972). However, took up Economics (Hons) and graduated from St Stephen's College, Delhi University in 1975. Passed Tripos in Economics Examination from Trinity College, Cambridge University, U.K. in 1977 and obtained the B.A(Hons) and M.A. Degrees. Was Lecturer in Economics for B.A. (Hons) Second and Final Year students in St Stephen's College, Delhi (1977-1979). At the same time, was also studying for the LLB Degree which he received in 1980 from Delhi University. Enrolled as an Advocate on 5.9.1980 with the Bar Council of Delhi and started practice in the Supreme Court of India and Delhi High Court. Initially joined the chamber of Shri Siddhartha Shanker Ray, Bar-at-Law (Senior Advocate) for about three years. Thereafter, practiced law independently. In 1986 he set up a law firm under the name of “Lawyers Associated”. Was partner in the firm till March, 2000. Thereafter, practiced in the Supreme Court and other High Courts as counsel and also advised on various aspects of law relating to finance, companies, properties, banking, contracts and other areas of commercial and civil law. Also has a keen interest in Personal Laws including Muslim Personal Law and has written several articles in this connection. Has contributed the section on “Deeds and other instruments” for Halsbury's Law of India. 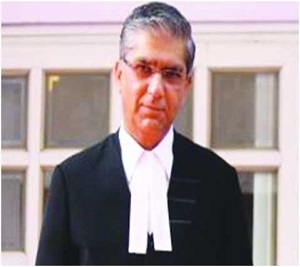 He is keenly interested in computers and knows several computer programming languages including Assembly, C Basic, Visual Basic and dialects of Dbase (including Clipper) and has written two stand-alone accounting software packages for lawyers: ACT-C and ACT-S. Till his elevation as an additional Judge of the Delhi High Court on 20th December, 2002, he was also the Secretary of Ghalib Institute, New Delhi. He is a keen sportsman and played Cricket and Football for the school. Was member of the St Stephen's College Tennis Team and played Tennis and Squash for Trinity College, Cambridge, U.K. Appointed as Chief Justice of High Court of Jammu & Kashmir vide notification No.K.13021/01/2017-US.II dated 24th March,2017 and took oath of office on 1st April, 2017.